1. What significant moves were made during the offseason? The C's signed free agent Amir Johnson to a two-year, $24-million deal (with a team option for the second). They traded Gerald Wallace and Chris Babb to the Warriors for David Lee, who has one season remaining on his contract at $15.5 million. Boston drafted Terry Rozier, R.J. Hunter and Jordan Mickey, and acquired Perry Jones from the Thunder in a salary-dump trade that involved the swapping of second-round draft picks. The Celtics also locked up Jae Crowder for five years at $35 million, and re-signed Jonas Jerebko for two years and $20 million (with a club option for year two as well). 2. What are the team's biggest strengths? A) Brad Stevens. No explanation necessary. B) Financial flexibility. Notice how most of the significant offseason moves didn't involve commitments beyond this season? Danny Ainge hasn't been able to draw in a superstar just yet, but he's keeping the door open. C) Depth. The difference between Boston's second-best player (Marcus Smart?) and its 10th-best player (Evan Turner?) is virtually non-existent--the reserve unit will likely be just as effective as the starters. The Celtics should have a huge advantage in most games when opposing team's benches are on the floor. 3. What is the team's biggest weakness? Also depth. The C's are a squad full of guys who's NBA talent ranges from mediocre (Tyler Zeller) to pretty good (Isaiah Thomas). It's a recipe for limited success. They have 11 established names deserving of minutes, plus James Young and three rookies who will battle for court time too. Not to mention a 16th player, Jones, who's looking to earn his place as well. How will Stevens get them all on the floor? 4. What are the goals for this team? Improve on last years' mark. Develop the kids (Smart, Young, Rozier, Hunter and Mickey are all 21 years old or younger). Play hard and try to resemble a franchise that is just one piece away from contending. 45-37 (6th in East). I'm convinced that if the Celtics had finished eighth in the conference last year instead of seventh, they could've given the Hawks a run for their money in Round 1. Outside of Cleveland, is there another Eastern Conference team that scares you in 2015-16? Don't be surprise if the spunky C's find themselves in the second round of the playoffs. 35-47 (10th in East). There's no logical explanation for how Boston was able to play .667 ball for the final two-and-half months of last season. What if the magic is gone? 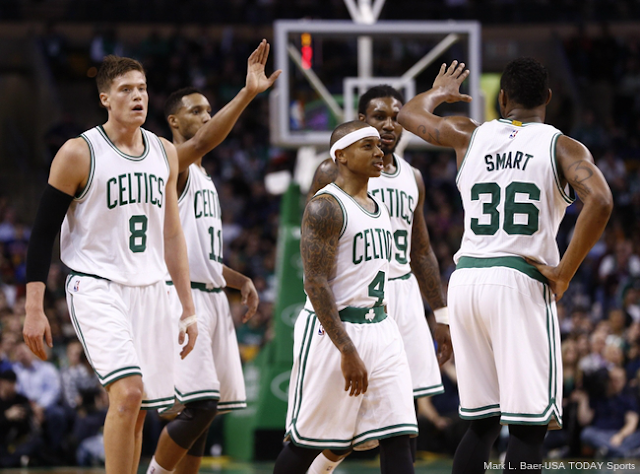 Without 2014-15 as a frame of reference, doesn't the Celtics roster look like it should be lottery-bound? For the record, the optimistic prediction is the one I'm officially going with.